"When I first got here, I was always told that we should never miss a chance to give students food," he says. "I foolishly thought at the time they meant Doritos and cookies. It's protein that they're after. It's crazy." Bunker Hill is home to one of 25 food assistance programs on Massachusetts' public college campuses. That leaves just four public campuses across the state without one. One first-year student at Bunker Hill, whose name we aren't using to protect her safety and privacy, was living in a shelter in Boston last summer when she first decided she wanted to enroll in classes here. But she says that shelter didn't feel safe. "If I wanted to get good grades, if I wanted to get a good education, I needed to be at a slightly safer shelter," she says. She was put on a long waiting list for a bed at a youth home and finally got in after six months. That's when she enrolled at Bunker Hill. Now she's majoring in math. "I knew that I really loved learning, but I wasn't sure if I was going to fit into the education system." She says she has been pleasantly surprised by Bunker Hill, though. "This is a really good place to figure out where you might go with your education," she says. Across the country, college administrators are increasingly seeing students like her. Researchers at the University of Wisconsin surveyed more than 4,000 undergrads at community colleges across the country. The results? Twenty percent of students reported being hungry, 13 percent homeless. Sara Goldrick-Rab, a sociologist who led the research team, says it's not just that college students need to work while in school. "It's that they're working, and borrowing," she says, "and sometimes still falling so short that they're going without having their basic needs met." Goldrick-Rab says she believes state and federal governments should work together to help college students find a place to live and something to eat so that they're ready to learn and, eventually, graduate. "Most people think, 'Well, if you're really poor, and you really don't have money to eat, you can get food stamps," she says. "What they don't know is that for a college student, who doesn't have children, to get food stamps requires that they work 20 hours a week." And that's exactly what the first-year student from Bunker Hill has managed to do. She's putting in 20 hours a week at a physics lab close by and has recently saved enough to rent an apartment with two roommates. She says she still needs help affording tuition and transportation. "I don't really need a whole lot of this or that. It's nice, but what helps me the most is people thinking that I'm going to make it." And her classmates and professors, she says, who allow her to feel like a normal college student. 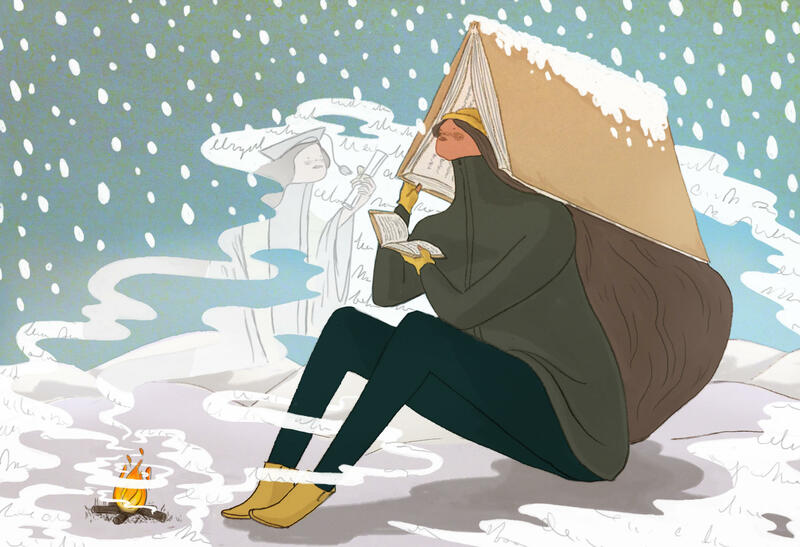 It's no secret that the cost of getting a college degree has skyrocketed, but far less known and just as startling is the rising number of college students who cannot afford to eat or are homeless. Kirk Carapezza has from member station WGBH has the story. KIRK CARAPEZZA, BYLINE: At Bunker Hill Community College in Boston, thousands of students are scheduling their spring semester courses, but that's not all some students are worried about. UNIDENTIFIED WOMAN: I want to still be able to work because, you know, I need to keep a roof over my head or try to. CARAPEZZA: We're not using this first-year student's name to protect her privacy and safety. She was living in a shelter last summer when she first decided to enroll at Bunker Hill, but she didn't feel safe there and wanted to find a bed at a youth home. UNIDENTIFIED WOMAN: If I wanted to get good grades, if I wanted to get a good education, I needed to be at a slightly safer shelter. CARAPEZZA: She was put on a long waiting list, then after six months, she finally got a bed, enrolled at Bunker Hill and decided to major in math. UNIDENTIFIED WOMAN: I knew that I really loved learning, but I wasn't sure if I was going to fit into the education system. And this is a really good place to figure out where you might go with your education. CARAPEZZA: She says each day is a struggle, and she's often not sure whether she'll have enough to get by. UNIDENTIFIED WOMAN: Homelessness is - it feels like being on a yo-yo. Sometimes you can afford it and then any little thing can make you unable to afford it. CARAPEZZA: Little things like a spike in the cost of transportation or an unexpected medical bill. College administrators are increasingly seeing students at four-year schools, too. In Massachusetts, a hub of higher education, 25 of the state's 29 public campuses are now hosting food assistance programs. Still, the problem is going largely unseen by the public. WICK SLOANE: It's invisible even to me, and I'm looking. CARAPEZZA: That's Wick Sloane. He came to Bunker Hill more than a decade ago to teach English full time, but he says he quickly became a part-time social worker. SLOANE: When I first got here, I was always told that we should never miss a chance to give students food. I foolishly thought at the time they meant, you know, Doritos, cookies. It's protein that they're after. It's crazy. CARAPEZZA: Researchers at the University of Wisconsin surveyed more than 4,000 undergrads at community colleges across the country. Twenty percent reported being hungry, 13 percent homeless. Sociologist Sara Goldrick-Rab led the research team. SARA GOLDRICK-RAB: The story today is not merely that people have to work. It's that they're working and borrowing and sometimes still falling so short that they're going without having their basic needs met. CARAPEZZA: Goldrick-Rab says state and federal governments should work together to help college students find a place to live and something to eat so that they're ready to learn and eventually graduate. GOLDRICK-RAB: Most people think, well, if you're really poor, and you really don't have money to eat, you can get food stamps. What they don't know is that for a college student who doesn't have children to get food stamps requires that they work 20 hours a week. CARAPEZZA: The Bunker Hill Community College student from earlier is working 20 hours a week at a physics lab, and this month she's finally saved up enough money to rent an apartment with two roommates. But she still needs help affording tuition, food and transportation. UNIDENTIFIED WOMAN: I don't really need a whole lot of this and that. It's nice, but what helps me the most is people thinking that I'm going to make it. CARAPEZZA: And her classmates and professors will allow her to feel like a normal college student. For NPR News, I'm Kirk Carapezza in Boston. Transcript provided by NPR, Copyright NPR.